The theme for 2009 was Twilight in the Islands. The Girl Scouts learned about people living on four major islands around the world—Puerto Rico, Iceland, Japan, and Tasmania. Our first activity in Tasmania was kayaking, every year at twilight we have some sort of water sport tied with our program and this year the kayaking was tied with Tasmania. Here we got a history lesson about how Tasmania broke from their mainland of Australia when the glaciers came and water flooded the plains in between them, to get back and forth the aboriginal people of Tasmania would kayak back and forth. 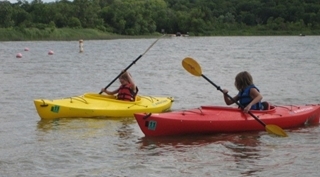 After short safety instructions we were able to get into our kayaks and paddle around. Off we went to make an arts and craft; in Tasmania we made a boomerang using dot design. The dot design is a special custom they use on all sorts of things, from pottery to instruments, the dot design tell stories by each dot and figure having a certain meaning to it. 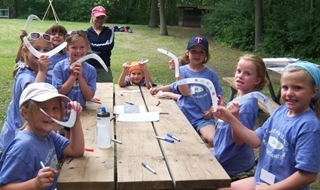 Most of the girls simply colored their boomerang with bright colors and pretty pictures. Everyone's favorite, snack, and was our next stop. They gave us a try of a unique Tasmanian/Australian favorite called Vegemite, which is simply a spread of yeast, salt and minerals, on top of wheat thin. All the girls at least tried the unique spread and although some girls made faces, there were some that enjoyed the snack, I'm just happy they all had the courage to try something new and go out of their norm. We also had a Tim Tam which is to Tasmania as an Oreo cookie is to us, the cookie was very good and everyone was asking for seconds. Our last stop was an informative tour of Tasmania with three different parts in three different areas on the site; it really was 'a tour of Tasmania!' First part of the tour we learned about how Tasmania was a penal colony, meaning they would send people there to go to prison. They showed us what they ate and the cloths they wore. Second part of the tour was a trip the temperate rainforest where they taught us about the differences between a tropical and a temperate rainforest, and even gave us a fern to plant at home! Last part of our tour was a show of all the animals on the island, and because they are an island and so secluded they have many animals that no other place in the world our found but Tasmania. We visited the county and island of Iceland! This was quite an insight to the girls since few really knew much about it. First we started with the arts and craft project, we made our very own gnome pictures on tiles, and learned the stories that started the character of a gnome in the first place. It was interesting to see the contrast between the girls and the boys from Sib Care. Most of girls made a traditional gnome with a white fluffy beard and a pointed hat (kind of like the dwarfs in snow white). The boys in Sib Care made less traditional, making some of their gnomes 'army' gnomes (dressing them in the usual camouflage colors ex. green, black and brown) others even made clown gnomes. Once we finished our gnomes we went and learned about Iceland games and orienteering. 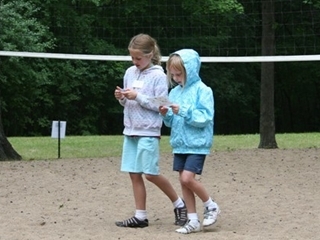 The games involved using five rocks and throwing them in the air and trying to get them to land on the back of your hand. If you were lucky and were able to get some on the back of your hand then you have to try to throw them once more and grab them with your front of your hand. The game was very tricky and the most the girls were able to get was three on the first try, go Emma! Orienteering, which is using a compass, was tricky but once you used your clues and compass you found different flags that had different facts about the Vikings. Next stop was all the girls’ favorite, snack. The snacks consisted of creams puffs, which are given out on Bolludagur or Bun-day, two days before lent, and an Iceland cookie, which reminded us of gingerbread cookies, but was more of a pepper cookie, thank you to the mom who made more than 300 of them, homemade. We also learned more facts about Iceland, such as Iceland has only 300,000 people there, which is about the population of Minneapolis. Last we went to an activity that taught us about geothermal energy, and how Iceland is one of leading countries using geothermal energy by taking advantage of the island being a volcano. 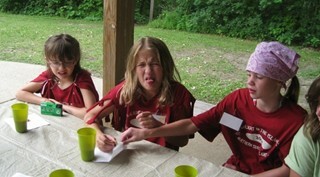 We did an experiment with the girls showing how hot water can be turned into cold water with a snap of your fingers. The leader was even the owner of UMR Geothermal, a geothermal company in Minnesota. 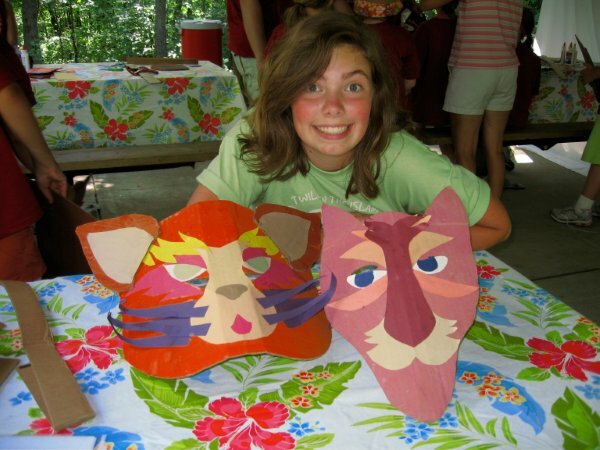 The first activity we had was mask making—each scout was given a piece of colored cardboard to cut out and decorate in the style of traditional Puerto Rican masks. Though most of these authentic masks are more like a many-horned dragon or monster in appearance, the girls could make a mask depicting anything from a puppy to a manatee. Moving on from the masks, the Girl Scouts were given an introduction to Puerto Rican dancing—specifically, salsa dancing. With two instructors, one wearing the traditional flowing skirt associated with salsa, the scouts were led through the basic steps of the dance with a partner. Once they had grown more comfortable with the movements, they did the dance to bright Latin music. The last activity centered on the stars. In the observatory activity, the girls learned a little about the famous Arecibo Observatory located in Puerto Rico. Next, they folded a paper fortuneteller that, instead of just numbers and colors, had famous constellations such as Leo, Capricorn, and Cygnus. 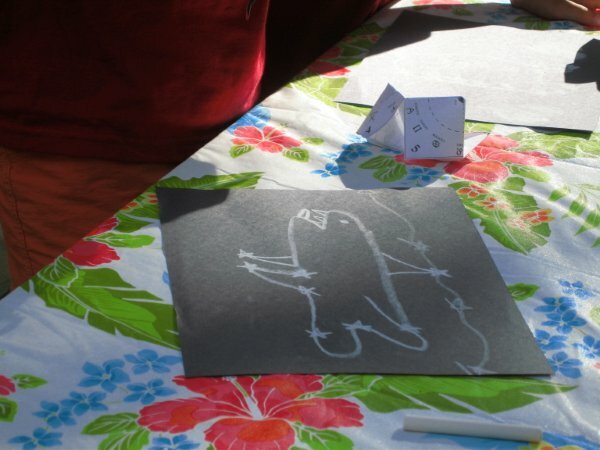 Then each girl got to create a constellation of her own with chalk on black paper. Finally, each group of girls worked together with a piece of fabric and brightly patterned stars to make a constellation to represent them as a whole. 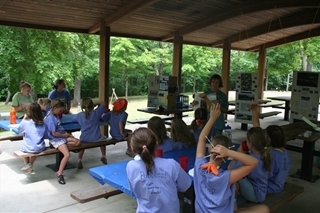 Upon arrival, the Girl Scouts learned about the culture and language of the island country. 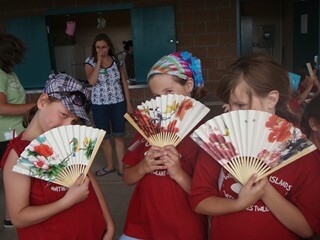 They learned how to correctly greet others based on their social status, and say phrases such as “hello,” “thank you,” and “welcome.” The girls then tried on kimonos and fanned each other quite enthusiastically with patterned paper fans. Another stop in the Japan station taught about Japanese art, including origami and the different character alphabets. The scouts folded cups and elegant cranes from flowered origami paper, and copied characters representing their favorite animals. 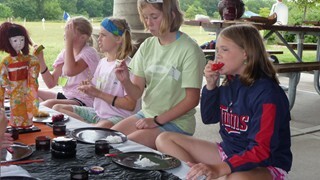 After their art projects, the girls sat down to a snack of ‘candy sushi’ (made of a fruit roll-up wrapped around a Rice Krispie bar and a piece of licorice) and rice noodles with soy or sweet and sour sauce. They were also told about Japanese traditions involving food—from burning wooden chopsticks after use to gathering rice and storing it in ornate bowls. 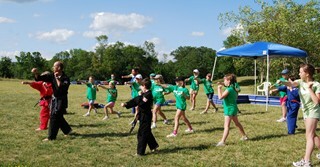 A final activity for the girl s was a karate lesson. Teachers and students from USA Karate demonstrated various kicks, punches, and elbow jabs while teaching values that are important in martial arts—qualities like respect and perseverance.